Somehow, I don’t think Officer Tompkins scared Anya away. Happy Wednesday! Coming up, more Anya and Jacob and Larry and Edison and Stephanie. And a chicken or two. Yeah, they ‘frolic’ a lot. Frolic: Lissa’s favorite euphuism, replacing a four-letter ‘F-word’ with a six-letter ‘F-word’. It’s the same thing, only longer (snick). Yeah “Frolic” is a great euphemism, ‘cept now “Puff The Magic Dragon” takes on a whole new meaning. I don’t know what’s more entertaining, the comic or the commentary. In either case, Vas is highly amused. I’ve said it before and I’ll say it again: Groovy, Kinda has the best commenters ever. Smart, funny, and above all, well-behaved. It’s rare, and you should be proud of yourself. You too. And, yes, of course, you. Oh, cheer up, Mr. Crankypants. You never know. Anya’s overdue for some happiness. Sam Kieth is the author / illustrator of several serialized comics including “The MAXX” (1993). The story is a real challenge and Julie Winters is still one of my all-time favorite comic characters. Kieth met his wife when he was 15 years old and she was 30. They lived together quietly until he was 18 years old and it was legal. Kieth and his wife have been together for 35 years. Much of Kieth’s work deals the with complexities of age differences in relationships. 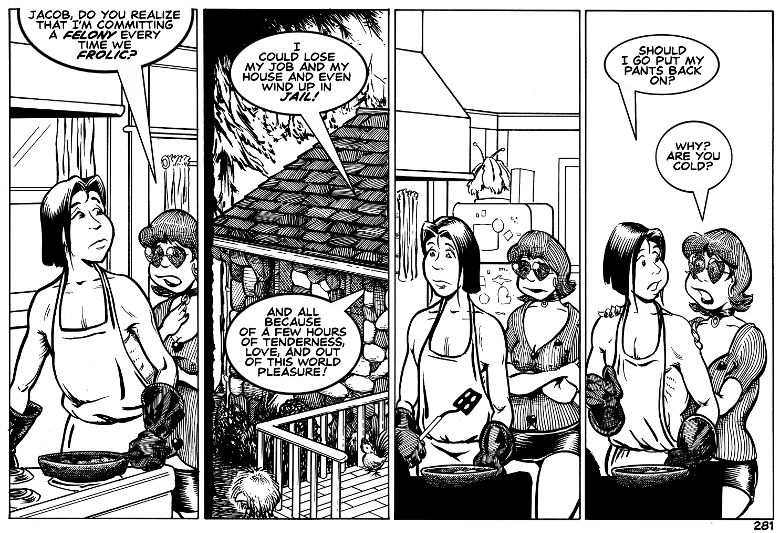 His graphic novel “My Inner Bimbo” is heavily influenced by the early days of his relationship with his wife. With a little self-control, Anya and Jacob could have it all. Read that as “lived together quietly”. Then again, they’re probably pretty noisy (snick, snick). Seriously, Anya may have found a young example of a ‘Larry guy’ who wants to be more than ‘chums’. I cringed when Larry dismissed he and Anya as chums. Observation: Anya’s emotional development seems to have stalled when she was about 15 years old. She can’t go back, but she can hopefully grow and mature with Jacob. Eleanor is toxic . . . I love this comic. The dialogue is intelligent and entertaining, and the story keeps me guessing. It messes with my assumptions. Thank you. It surprises me too, sometimes. I am hyperventilating with teary laughter as I wonder whether I am going to hell for cackling at this. Now you know how I felt when I wrote it. If I believed in Hell, I know I be scheduled for a trip “Downhill!”.